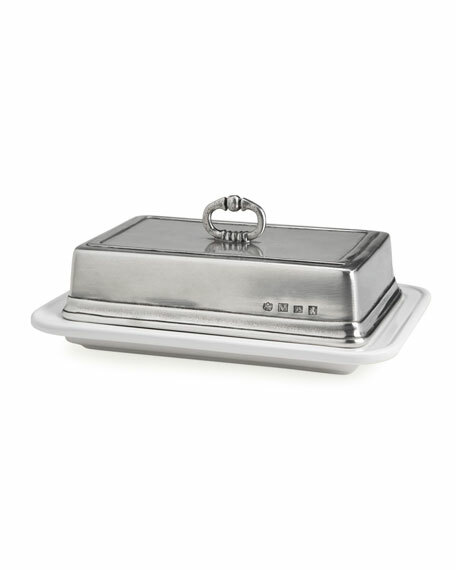 Double butter dish is also the perfect size for European-style butter or cream cheese. Ceramic butter dish with pewter lid. Pewter is handmade by artisans in Northern Italy. Lead-free and safe for everyday use. 7.3"W x 5.1"D x 3.1"T.
Match pewter is handmade by artisans in the north of Italy. Each piece is made with an alloy that is food safe, lead-free, and FDA approved and requires little or no care. Since 3000 BC, pewter has been used to make functional and decorative objects for the home. Today Match continues this ancient tradition using methods that have been passed down through generations of Italian artisans. The hallmarks on each piece are the signatures of their skilled hands. Each piece of Match pewter is a testament to the timeless values of craft and authorship often overlooked in this age of speed and convenience. The classic forms harmonize with both traditional and modern settings. Its warm reflections recall celebrations at well laid tables and storytelling by candlelight.